Bill Beasley was one of the more successful breeders/owners in Canadian racing during the fifties and sixties. He was a regular shopper at the Windfields yearling sales and built his successful racing stable with astute purchases. One such purchase was Canadian Champ, the 1956 Canadian Horse of the Year. Beasley campaigned three Horse of the Year recipients, two of which he bred. Both of those came from the same mare, and they were Hidden Treasure and He’s A Smoothie. Ratine was the mare that produced for Beasley the two champion siblings. She was a bay daughter of undefeated English Triple Crown winner Bahram. Ratine won only once from nineteen races, but earned her place in Canadian racing folklore with her broodmare production. Hidden Treasure was a son of Kentucky Derby winner Dark Star, while the subject of this article He’s A Smoothie was sired by the legendary Round Table. By the time He’s A Smoothie entered the world during a thunderstorm 1963, Bill Beasley had suffered a stroke. He was confined to a wheel chair and lost his ability to speak for the rest of his life. He seldom, if ever left his home after the stroke. Beasley was however very keen to see his new colt sired by champion Round Table. He’s A Smoothie was a big leggy bay colt that resembled his dam sire Bahram more than his own sire. Round Table was a somewhat compact horse that could run on any type of surface. He’s A Smoothie would demonstrate the same versatility during his Hall of Fame career. However, because of his conformation type, the Beasley bred colt would not race as a two year old and took his time to mature. Beasley had to wait for He’s A Smoothie to show his talent, but the wait was well worth it. Bill Beasley’s son Warren was listed as the trainer to the colt, but in fact Warren was actually the manager of the stable after his father’s stroke. He has always been quick to point out that trainer Bobby Bateman was the mastermind behind He’s A Smoothie in becoming a great race horse. “He ran like a camel, always climbing” said Warren when recalling He’s A Smoothie in later years. “But he sure smoothed out didn’t he”. Bill Beasley would come to the backstretch barns or to the races when He’s A Smoothie was racing. His interest in the colt kept him alive. “He’s A Smoothie touched our lives in many ways, but mostly my father”, said Warren “It gave him a great deal of joy to see the horse he loved so much run and win”. The first win for He’s A Smoothie came in May 1966 at Fort Erie in a maiden allowance race. The three year old crop of 1966 was deep and talented. Titled Hero was the reigning champion juvenile and would capture the Queen’s Plate over the very good Bye And Near. He’s A Smoothie was not quite ready to take on such horses at this point in time but was making steady progress none the less. He’s A Smoothie finished second to Bye And Near in the Québec Derby and announced his presence when he captured the Mohawk and Fairbanks handicaps and then the classic Prince Of Wales Stakes, defeating the crack filly Ice Water in the latter. It seemed as if He’s A Smoothie needed a distance of ground to get his long legs in sync. He captured the ten furlong Seagram Cup and the fourteen furlong Valedictory Stakes later in the year to close out his promising three year old season. In the later he beat Native Victor, a then highly regarded half brother of Northern Dancer. He’s A Smoothie was beginning to put it all together. 1967 was the year of Canada’s centennial, and He’s A Smoothie would lead the way on the race track for the proud Canadian patriot Bill Beasley. His last two stakes wins as a three year old came against older horses. Returning for another campaign was the previous year’s Canadian Horse of the Year Victorian Era, racing under the colours of Windfields Farm. Bye And Near, Ice Water and Native Victor were all back as well. It promised to be an exciting season in the handicap ranks. Victorian Era defeated He’s A Smoothie in the seven furlong Jacques Cartier Stakes and then in the eight and a half furlong Vigil Handicap another third place finish was posted by He’s A Smoothie. The Eclipse Handicap however became the race in which He’s A Smoothie would exact revenge on a pair of horses that had beaten him prior. Bye And Near was second and Victorian Era finished third to the son of Ratine. These races were on the dirt and were shorter than his best distance. He’s A Smoothie then reeled of the Durham Cup and Seagram Cup, which were both ten furlongs on dirt, as well as the ten furlong Canadian Maturity on grass. Among the vanquished in these races were Ice Water and Victorian Era. He’s A Smoothie was entered in the Canadian International on the Woodbine turf course. The race at the time was a thirteen furlong affair and attracted some very good international grass specialists. French invader Canadel, who had won the Prix de la Salamandre and the Niagara Handicap, was the main threat. 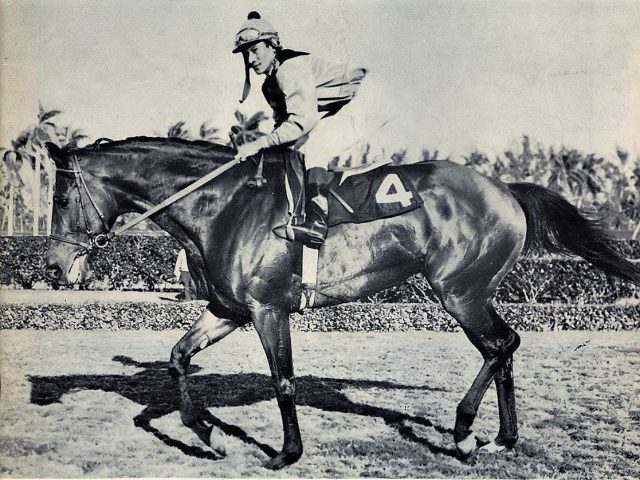 The winner in the two previous runnings was Hall of Fame Canadian star George Royal, while the race prior to those was won by Greentree Stable’s international star The Axe II. Stepping onto the spotlight of international competition did not faze He’s A Smoothie. He powered his way with a devastating stretch drive and won going away from Canadel to take Canada’s biggest global race in the country’s centennial year. The win was very popular with the locals, and many tears were shed when wheel chair bound Bill Beasley came to the winner’s circle. The big horse walked over to his beloved owner and put his head in Beasley’s lap. Tears were rolling down Beasley’s cheeks. It was one of the most touching scenes ever witnessed at a race track. Irish jockey “Smilin” Sam McComb rode He’s A Smoothie that day. The jock had been down on his luck and was attempting a comeback when he got the call from Warren Beasley to ride He’s A Smoothie. Avelino Gomez was the first call rider for the colt but he elected to ride Orbiter, so McComb got the mount. “In somebody’s life when you think things aren’t going too well, someone comes along to ask you to ride a super horse like him. It was like sitting on a big Cadillac”, McComb would say later. He’s A Smoothie’s Canadian International win had opened the eyes of the international racing community. Warren Beasley received an invitation to bring He’s A Smoothie to Laurel Park for the Washington D.C. International. Beasley accepted and the emerging star was off to Baltimore. The Washington D.C. International had established itself as one of the premier events on the world racing calendar. The 1967 edition attracted a stellar field. Soon to be champion three year old Damascus, and Australian champion Tobin Bronze was in. Another highly regarded horse entered for the race was grass specialist Fort Marcy. He’s A Smoothie was to carry seven more pounds in the twelve furlong race than these rivals. He’s A Smoothie went to the lead from the off and held as much as a four length advantage going into the far turn from home. However he could not sustain his speed carrying the higher weight and finished five lengths back of Fort Marcy, with Damascus second and Tobin Bronze third. On the basis of Fort Marcy’s victory he would be named as the Champion Grass Horse in the U.S. The first of three consecutive such titles for the Hall of Fame inductee. The next race for He’s A Smoothie came in the two mile long Display Handicap at Aqueduct, in which he would be the high weight entrant. The Canadian finished the race with a stirring drive but came up a length short in second place of Quicken Tree, who carried nine less pounds. This was the final race for He’s A Smoothie in 1967. One more accolade came his way when he was the unanimous choice as Canadian Horse of the Year. Warren Beasley decided to winter He’s A Smoothie at Gulfstream Park in Florida and enter the horse in the series of turf handicap races on the Florida circuit. On January 24, 1968 he finished second in the Palm Beach Handicap, and then three weeks later was third in the Bougainvillea Handicap. Again these races were a bit short for the long winded champion since the distances were eight and half furlongs and nine and a half furlongs respectively. Thirteen days later He’s A Smoothie was in the Hialeah starting gate for the rich Hialeah Turf Cup. This race was more to his style since it was to be run at twelve furlongs. He’s A Smoothie captured the race with one of his relentless stretch drives, thus avenging his defeat by Flit-To and Irish Rebellion in the Bougainvillea. He’s A Smoothie had earned a rest. He made one start at Fort Erie in a nine and a half furlong allowance race upon his return to racing. He set a new course record in the race, which added to his track records on dirt at both Greenwood and Woodbine. He appeared to getting the hang of using his speed earlier and not requiring longer distances to wind up his long legs. Due to his new found stardom and reputation as a consistent runner, He’s A Smoothie had attracted attention from breeding farms looking to stand the son of Round Table at stud. Beasley accepted an offer from a California based syndicate led by William Pasko III. The plan was to continue racing He’s A Smoothie for the remainder of the year and then begin his stud career for the following breeding season. However tragedy struck on August 7. 1968 when He’s A Smoothie sustained an untreatable leg injury at Saratoga in the Bernard Baruch Handicap. Jockey Braulio Baeza was just getting his partner open for the stretch drive when He’s A Smoothie stepped in a hole. His ligaments were completely severed, so there was no other option but to humanely euthanize him and end his suffering. The dark side of racing had reared its ugly head on another beloved horse. “Smilin” Sam McComb heard about the tragedy as he was going to the post at Fort Erie. “I lost a few tears that day. It is not easy to put a smile on all the time”. He’s A Smoothie would be enshrined in the Canadian Racing Hall of Fame in 2003. His half brother Hidden Treasure was added to the hall in 2013. Final recognition for both horses is deservedly earned. The final totals for He’s A Smoothie read like this; 38 starts, 18 wins, 4 seconds and 6 show finishes. He could be a feisty fellow, but when Bill Beasley was present he would be docile and easy going. “I’m sure he ran for Mr. Beasley” said Bobby Bateman. “When the car drove up to the stables, they would roll down the window and Smoothie would put his head in so Mr. Beasley could rub his nose. When they left the colt would start rearing up and kicking. He didn’t want Mr. Beasley to go”. He’s A Smoothie also enjoyed his racing. He proved that he could carry a fair amount of weight and had a determined stretch run finishing kick. Smoothie could rate on the lead or come from behind and won on all types of racing surfaces. He also gave Canadian racing fans plenty to cheer for during the early emergence of the country as a top producing thoroughbred region. He’s A Smoothie was the best horse and obvious favourite of long time Canadian turf patron Bill Beasley. He was the favourite horse of the author’s father-in-law, as well as a favourite of many other long time racing fans. Only a hero can evoke such a following.